Hello boss. Quick thank you and question. I have Kenmore 70 series heavy duty Wash machine that recently broke. I fixed it by replacing the direct drive coupler (using your diagrams!). After a put it together, I ran a test load and my washer overflowed (this wasn’t happening before). Is it possible that I fried the water level control switch? Everything’s plugged in properly. Is there a float or something else I’m missing? Wife wants to buy a new washer, but I think it’ll work fine if the water will shut off. Thanks. Ain’t no thang, m’main man. You probably just got the air tube for the pressure switch pinched when you re-installed the cabinet. This photo ‘splains it all to you. Yea verily, flip that console up, unpinch that puppy and marital bliss shall be restored unto thee. Go whup up on that bad boy! 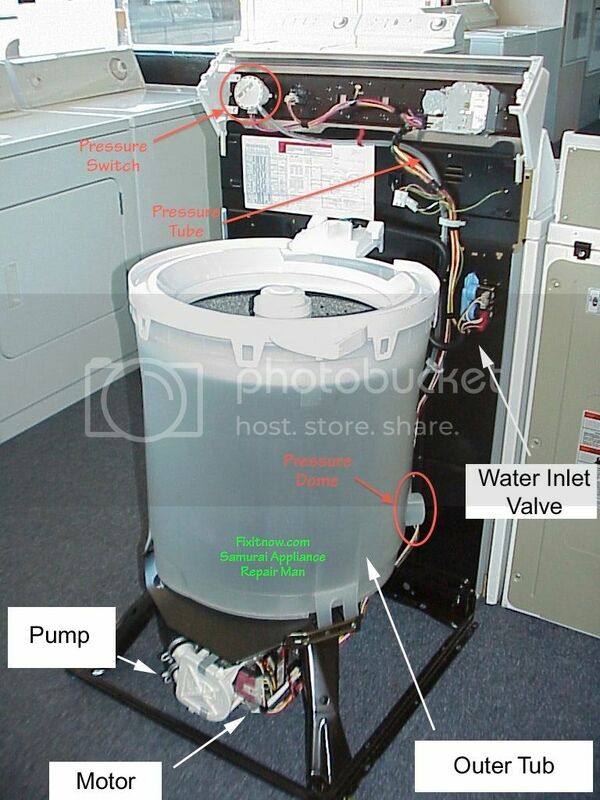 This entry was posted in Washer Repair on July 12, 2003 by Samurai Appliance Repair Man.